Pumpkins: It is what brightens the fall season when the skies get dark earlier. I love pumpkin smoothies, and I try to extend my personal "pumpkin smoothie season" for as long as possible by stockpiling pie pumpkins every fall weekend, puréeing, then storing it in the freezer. When the winter ended (finally! ), however, it was also time to say goodbye to the last bit of my frozen pumpkin purée and pray that fall comes around again soon. I had just enough pumpkin purée left to try something different with it: a pumpkin pasta sauce, to go along with some fresh pumpkin fettuccine I had gotten from Penn Mac. I figured it might work well with sausage, fall spices, and some herbs, and came across this Rachael Ray recipe that seemed to fit pretty much what I was trying to go for. I used my own pumpkin purée, of course, as opposed to the canned variety called for in the recipe, and was a bit more generous with the cinnamon and nutmeg, because, well, I like my fall spices. 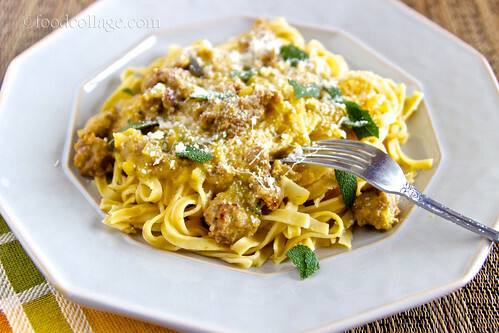 Next time I might try it with spicy Italian sausage and use parsley instead of sage. I didn't mind the sage, but I think I might prefer something a little less dominant.